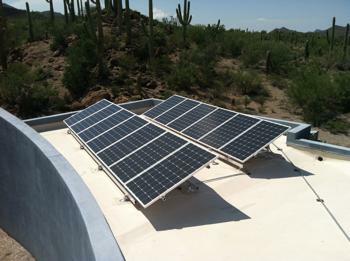 Does Tucson Solar Power Make Sense For You? Energy costs are steadily rising and with oil being a limited resource it is wise to seek out a better solution for you and your family. Sunlight is an abundant and clean source of energy. Solar panels in Tucson and throughout Arizona have been increasing in popularity in addition to the technology becoming more refined and efficient. For the most part, we install residential solar systems that are tied into the grid. We are not limited to residential installments and would be happy to price out a commercial project. Most systems are within a range of 2.5 kilowatts to 20 kilowatts. However, we take pride in the fact that we can do it all. We have the skills and know how to install a completely off-grid system which would entail a battery bank to store the power for later use. This allows there to be energy to use even when the sun is not shining or at night. If you are tied into the grid you also have the option of doing a combination with a standalone battery backup as well. When it comes to mounting the panels we can attach them to either a flat roof or a pitched roof. They can be secured by a ballast weighted system that allows the panels to be mounted without penetrating the roof. Otherwise, the normal mounting can be installed which is bolted to the roof. Some people desire to have their panels located on the ground. We can also install your panels with a ground mounting system. We will simply run the cables from the panel’s location to your home. This is a great option if your house is shaded by a lot of trees or is not positioned to catch the optimum amount sunlight. Another practical alternative is a carport with solar panels on top, creating a multi-purpose solution for energy. And we can also build a carport for you if there is not an existing structure. 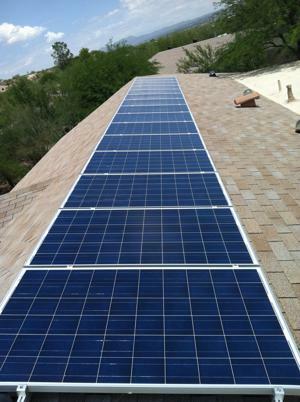 Should You Lease Or Buy Solar Panels in Tucson? Leasing your solar panels actually ends up costing you a lot more in the long run, and we want you to get the most value from your investment. We encourage customers to buy their system outright if possible. Typically, a leasing contract runs 20 years for around $120 for a $20,000 system. While this might sound great, let’s take a deeper look. Every month $180 is spent on average on the electricity bill for a home that would require $20,000 in solar panels. When we calculate the amount of kilowatts needed we aim to cover 80% to 90% of the energy needed so the system is not any bigger than needed. That would amount to a monthly savings of $144-$162 (80% -90% of $180) each month. Your panels would pay for themselves in as little as 10 years or less as standard energy costs keep going up. Therefore, a 20-year lease of $120 no longer sounds appealing. How Long Do Solar Panels in Arizona Last? We care about our customers and understand things happen. That's why warranties are extremely important to us. Since there are no moving parts in the panels themselves, regular maintenance is not required. However, in case anything breaks, cracks, or falls apart on the panels, a 10-year workmanship warranty is included. There is also a 20-year output warranty in case the panels are not producing as much energy as they should be outside of normal wear and tear. We mostly use SMA Sunny Boy inverters and they give a 10-year warranty on their product. Our panels can take monsoon-like weather and can even handle 1-inch hail falling at high velocity, but they can be damaged by intense weather. It is a good idea to add them to your homeowners insurance policy as a safety net. It is typically $200 per panel to replace them. Solar panels are actually pretty low maintenance when it comes to upkeep. Dust will not affect their ability to absorb sunlight. In the case that they become visibly very dirty, then it is time to clean them off. Honestly, shading will affect the system the most. Therefore watching for overgrowth of nearby trees is a good preventative measure. We look forward to the opportunity to give your family the financial freedom that comes with getting energy from the sun.